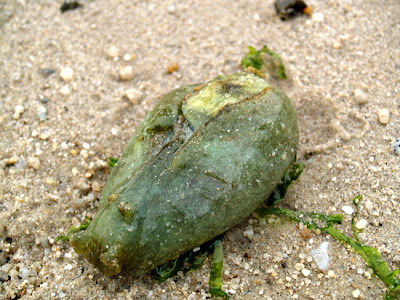 Was at Changi beach having a barbeque to celebrate my cousin's birthday and we took a stroll down the beach when I found this intriguing creature. At first I thought it was just some rotting fruit but it started moving and when I peered down, it looked more like a sea hare. Then an uncle came and told me not to go near it as it was a jellyfish. And as I left, I saw him kicking it back into the sea (felt so bad after that). Then at night, we went to a stretch of metal railings that was designated as the fishing spot. As the anglers lashed out their lines at the pitch dark waters, lit only with the city lights and the occasional headlamps of landing planes, my cousin told me to take a look below. To my utter amazement, there were glowing streaks in the water! And I looked on and figured that they were actually luminiscent fishes. How amazing is that? 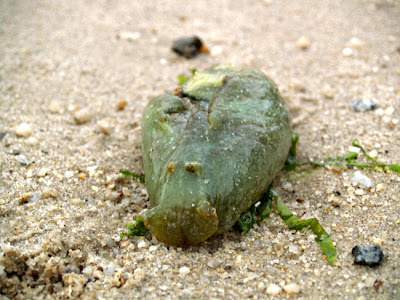 If I am not wrong - the creature is call Sea Hare. They feed on algae and will emit a purple dye when disturbed.